I wrote about absinthe cocktail books just over six months ago, and at that time there were only a few such books around. As we approach the holiday season, things are hotting up with at least two new absinthe cocktail books being launched. The first one, A Taste for Absinthe, written by R. Winston Guthrie with James F. Thompson, has just been launched in North America, and it's a clear step up from the books I reviewed six months ago. 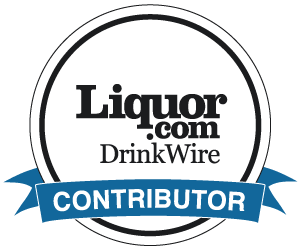 R. Winston Guthrie is an absinthe expert and the founder of The Absinthe Buyers Guide. The Guide itself is a litte out-of-date for Americans (with very little on the current absinthe scene in the USA, whether it be absinthe made in the USA or absinthe sold in bars and stores in the USA): however Winston tells me that the Guide will be updated to reflect both the current US market and European absinthes. His book is already up-to-date and thus very relevant for US readers. It is very much "born in the USA," with absinthe and absinthe cocktails as found across the USA today. 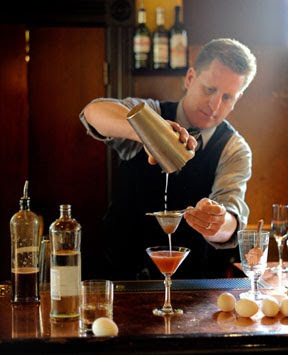 Ryan Fitzgerald of San Francisco, making the Hermitage, blending mezcal, maraschino, Dubonnet rouge, grapefruit bitters and absinthe. Others have commented on Amazon on the recipes themselves as being quite complex, calling for many different ingredients. I calculated that I could probably make around 20 of the 65 cocktails at home now, and I think my cocktail cabinet is about "average" (for an absinthe drinker, that is). In fact, I think it's much more interesting to have "aspirational" cocktails to work to; ones where I have to get an additional ingredient or two. 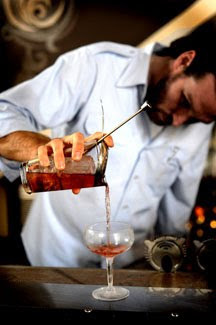 I like the fact that many different mixologists have provided cocktails; I also like it that Winston often indicates where a blanche or a verte is called for (as opposed to always saying "1 ounce of absinthe"). In addition to the cocktails themselves, there is a fair amount of additional information. Nothing very new for those who know their absinthe, but useful - and accurate - for beginners. 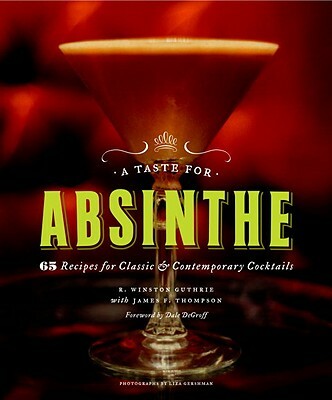 A Taste for Absinthe is now available from Amazon USA, Amazon Canada, and Amazon UK (as an import?). It would make a very good gift for both current absinthe drinkers and for beginners. If you do buy it as a gift, beware: you may find yourself using the book before you've wrapped it. Thanks to Winston and to all those who contributed to the book. It must have been tough work, but it was definitely worthwhile. Santé! An interesting post, cocktail books are quite variable so it's nice to have review to help you decide. I'm currently enjoying Kate Simon's new book (arrived today), I like the mix of classic and new cocktails. Thanks, David. My copy of Kate's book arrived minutes after your comment and I'll review it next week. At first glance, I can tell you that if you enjoy Kate's book, you'll definitely enjoy A Taste for Absinthe too! 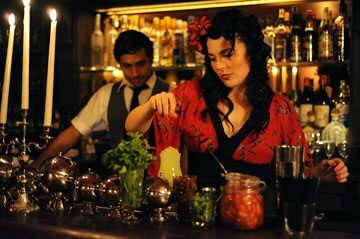 I assume that picture of Mae Lane from Griffou is from the restaurant at the Hotel Griffou in New York. Now I want to go there just to see her. She's a doll! Yes, that's the bar but it would be a long trip for you, Braggi. If the "doll" factor is more important than the cocktails, there may be other options closer to you!